Research has shown that getting a good night’s sleep is one way to stay healthier and more productive during the day. Practice a relaxing bedtime ritual: A relaxing, routine activity right before bedtime conducted away from bright lights helps separate your sleep time from activities that can cause excitement, stress or anxiety which can make it more difficult to fall asleep, get sound and deep sleep or remain asleep. Avoid naps, especially in the afternoon, if you have trouble sleeping at night: Power napping may help you get through the day, but if you find that you can’t fall asleep at bedtime, eliminating even short catnaps may help. Exercise daily: Vigorous exercise is best, but even light exercise is better than no activity. Exercise at any time of day, but not at the expense of your sleep. Evaluate your room: Design your sleep environment to establish the conditions you need for sleep. Your bedroom should be cool – between 60 and 67 degrees. Your bedroom should also be free from any noise that can disturb your sleep. Finally, your bedroom should be free from any light. Check your room for noise or other distractions. This includes a bed partner’s sleep disruptions such as snoring. Consider using blackout curtains, eye shades, ear plugs, “white noise” machines, humidifiers, fans and other devices. 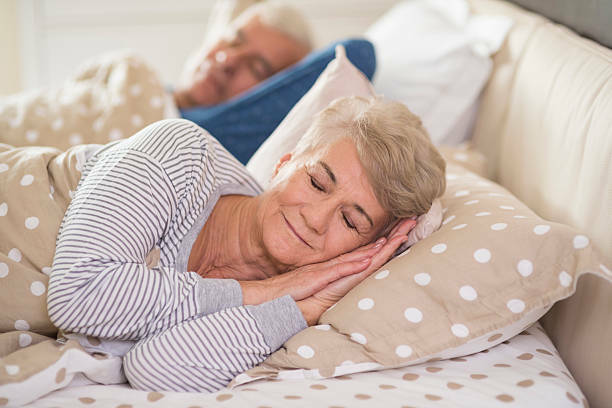 Sleep on a comfortable mattress and pillows: Make sure your mattress is comfortable and supportive. The one you have been using for years may have exceeded its life expectancy – about 9 or 10 years for most good quality mattresses. Have comfortable pillows and make the room attractive and inviting for sleep but also free of allergens that might affect you and objects that might cause you to slip or fall if you have to get up during the night. Use bright light to help manage your circadian rhythms: Avoid bright light in the evening an expose yourself to sunlight in the morning. This will keep your circadian rhythms in check. Avoid alcohol, cigarettes, and heavy meals in the evening: Alcohol, cigarettes and caffeine can disrupt sleep. Eating big or spicy meals can cause discomfort from indigestion that can make it hard to sleep. If you can, avoid eating large meals for two to three hours before bedtime. Try a light snack 45 minutes before bed if you’re still hungry. Wind down: Your body needs time to shift into sleep mode, so spend the last hour before bed doing a calming activity such as reading. For some people, using an electronic device such as a laptop can make it hard to fall asleep, because the particular type of light emanating from the screens of these devices is activating to the brain. If you trouble sleeping, avoid electronic before bed or in the middle of the night. If you’re still having trouble sleeping, don’t hesitate to speak with your doctor or to find asleep professional. You may also benefit from recording your sleep in a “Sleep Diary” to help you better evaluate common patterns or issues you may see with your sleep or sleeping habits.